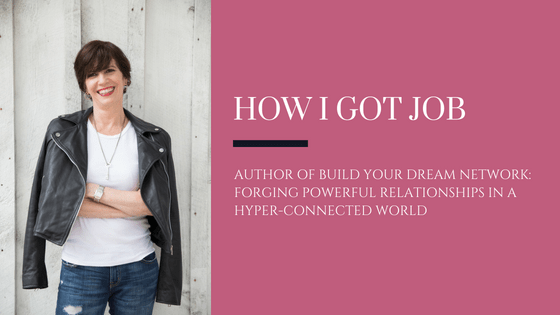 J. Kelly Hoey is the author of Build Your Dream Network: Forging Powerful Relationships In A Hyper-Connected World. She started her career as a corporate attorney before moving into management roles (including president of a global business network for women) then ultimately discovering her entrepreneurial ambitions when she became involved in New York City’s startup ecosystem in 2011. In the 1980’s – so a very long time ago! Not knowing what I really wanted to do or having made a firm decision on a course of studies, I obtained an undergraduate degree in Political Science and Economics from the University of Victoria back in 1987. I attended university in Canada and at the time, tuition costs were quite reasonable. I fell into my course of studies and had the luxury of taking classes such as “Russian Cinematography” because, well, I could. The cost of higher education and pressures to take courses related to a defined career discourage students from taking classes that simply allow their minds to creatively wander. I took a year between undergraduate and heading to law school to work. For six months I was a legislative intern in the British Columbia legislature. The experience was incredible (busy, demanding) and confirmed that I have zero tolerance for the nonsense of politics. I graduated from the University of British Columbia law school in 1991. When I decided to pursue a legal degree everyone remarked “we knew you’d become a lawyer”. No, I never knew I’d become a lawyer. I simply knew it was a useful degree (i.e. research, analysis, critical thinking and communication skills) that I could use to pursue a variety of professions (once I’d figured out exactly what I wanted to do exactly). And I was right. There was an expectation of pursuing a professional degree and being the dutiful middle child, I lived up to expectations. Ultimately, I really enjoyed the practice of law, especially the three-year period in Toronto when my practice focused primarily on corporate insolvencies. I worked on leading cases with extraordinary colleagues. I was frequently pushed out of my comfort zone but when you have the security of great mentors, you can do that. Don’t approach any job as “just a job”. I held a variety of part-time jobs to pay my way through university (retail, restaurant etc.) and I approached each as if it was the role I’d always be destined to do. It’s always about the team. You’ll get a lot further in life if you’re a team player, so work well with others. By others I mean everyone – from support staff to interns to peers – not just with the “boss” or honcho in the corner office. Be a life long learner. Perhaps this is a hangover from my eleven years of being a lawyer. Lawyers “practice” law. They are always improving their skills, studying and refining their craft. You never quite arrive as a lawyer because a court decision can change the law or a new set of facts puts regulations under scrutiny. I take this approach to everything I do. Today you’re so much more fortunate in seeking out information on how to prepare for an interview. There are endless blogs, articles, instructional videos – you’re not simply left asking your parents what to do. Leverage online resources. Make use of the career services office at your university or college. Attend job fairs and ask the question “tell me about your interview process?” (then follow-up with additional questions so get a full picture of how the process works). Seek the advice of others who presently work at the company you’re interested in interviewing with (i.e. friends or alumni of your college). Katharine Graham’s memoir “Personal History”. You can’t foresee everything that will come at you in life, so don’t expend a whole bunch of energy worrying about it. And you may find yourself tossed into a leadership role unexpectedly. This book will help you navigate the mental doubts and more. Stephen King’s book “On Writing”. No, this book is not just for those who have a desire to write fiction. This book is King’s resume. It’s about why and how he pursues his craft. What you choose as a career is your craft. Read his book through that lens and understand your motivation to pursue whatever it is you’re seeking to do. I rely on my network for recommendations. I watch to see what they are reading, recommending, tweeting about etc. And I’m an avid listener of NPR. There is a great case study interview in my book “Build Your Dream Network” with Amanda Ellis, an experienced recruiter in the legal industry. My recommendation would be to read Amanda’s interview (it starts at page 158)! Leverage your network to find opportunities and introductions. Tell people precisely what types of roles you’re seeking (no one is going to refer you to a great role if all you tell them is “I’m looking for a job”). Another great case study interview in my book is on landing a post-college dream job (it starts at page 59). How Jessica Peltz-Zatulove a graduate of the Kelley School of Business at Indiana University landed a dream job on Madison Avenue in the advertising industry when she didn’t know a soul in New York City, is the roadmap to sending resumes and writing cover-letters that others should follow. When I think about one role in particular (manager of professional development at a global law firm), I know I got the job because I had (1) researched the role and industry thoroughly; (2) connected with industry peers in the year before I got the job (so I had a clear understanding of and insights into the challenges they were facing); (3) attended industry conferences before landing the job as well as reading relevant books, articles, blogs etc., and developed my own point-of-view on how to approach the particular role; and (4) mentors from all the networking I had done over nearly two years to make the career transition who coached me through the interview process (including salary expectations). Finally, I was flexible during the interview process itself (scheduling, etc.). I made it easy for the firm to, not only see me in the actual role but to hire me as well. If it is something you really want to do, persist. I was the runner-up on numerous law firm management roles (‘over qualified, thought you’d get bored’ etc.) and it was annoying, incredibly frustrating and beyond disappointing. Having a strong commitment to the career path you’ve chosen and a support system (friends, family, colleagues in the industry) give you the strength to keep going.